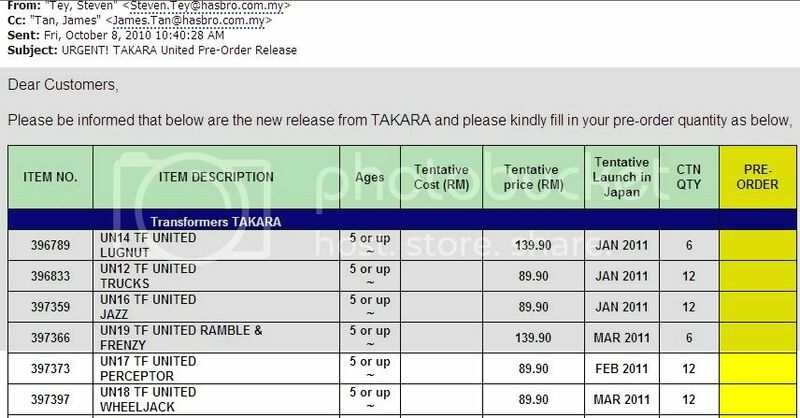 I just wanted to share an exerpt of an email I received from a Hasbro Malaysia representative for preorders of Takara Transformers United toys. Lots of interesting stuff, in particular UN-22 Char. Char was the G1 Japanese name for Kup. So he is more or less confirmed. Furthermore, UN-19 is Ramble & Frenzy! UN-18 is Wheeljack! Edited by Meister79, 08 October 2010 - 02:59 AM. *blinks* I don't see "Char" on there. ...Voyager Rumble and Frenzy? I wonder what they could be? Sorry, forgot to post the 2nd pic. Or maybe they won't point out which is which, and have the tell-tale accessories in neutral colors that fit with both. Why would Kup/ Char be red? In 1979 the very first gundam show aired. The main character's rival's name is Char Aznable. Char is known for piloting robots that are red. And with all these cassettes updated, maybe updates of Blaster and Soundwave won't be too far behind. SDCC Blaster is still on HTS, for $50. I'd say act fast before they AFA that jive and jack up the price. ...updates of Blaster and Soundwave won't be too far behind. I'm relatively certain Meister meant updates with original cassette-sized 'Deployers'. Yeah, you read my mind. I do know what Smitty means, and yes, we did get a new Soundwave in Genrations lately, but an Earth mode G1 Soundwave compatible with his minions would rock.